This dark comedy about food, funerals and feeding schemes is led by humour that tows along facts and ideas in its wake. By LESLEY STONES. The theatre, like the film business, doesn’t have many strong roles for older women, and certainly not for older black women. Just ask all the women demanding equality at the Oscars and the Golden Globes. 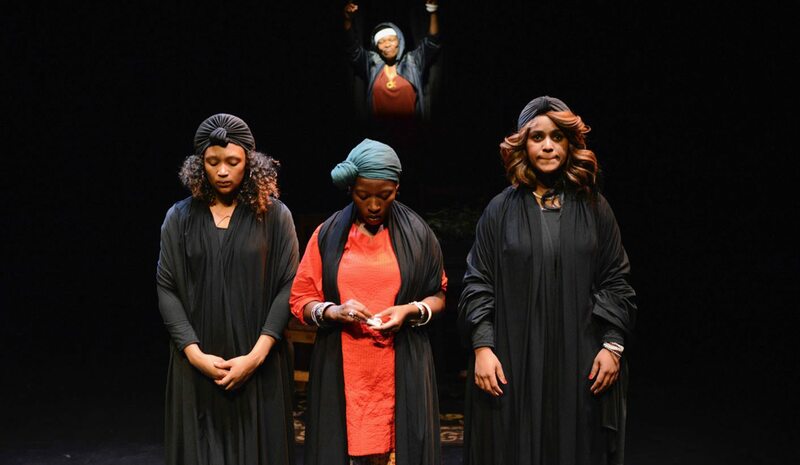 Yet here in our highly inequitable South Africa, a new play hands four black women the funniest, sharpest and most wonderful lines and characters. And it’s written by a middle-aged man. Proof that not all men are bad, even though that’s what Mike van Graan repeatedly has his women telling us. Van Graan is a biting satirist whose previous works including Bafana Republic and Pay Back the Curry left me helpless with laughter. Others, like Rainbow Scars and When Swallows Cry, are far more serious, but use humour to comment and pass judgement on our actions or nudge us to rewire our thinking. His 30 plays and his involvement with various organisations to promote cultural diversity make Van Graan a towering force in the theatrical world, yet he’s streetwise as an alley cat. This latest play, Another One’s Bread, focuses on three professional mourners in Khayelitsha, hired to cry at funerals or to pad out the crowd in case nobody turns up. Its title comes from the Afrikaans phrase “een man se dood is ‘n ander man se brood” (One man’s death is another man’s bread). The mourners pocket the wages, put some cash into a feeding scheme for children and round up any leftover funeral food to deliver to the hungry. They’re joined by a fourth younger member, fresh from jail for shoplifting sanitary pads for girls in her community, who can’t afford them. Van Graan captures the conversations and attitudes of his quartet delightfully, and the actors thrive on their words and deliver them with sass and gusto. All four are superb, with Motlatji Ditodi standing out as golden-haired Andiswa, who switches to a plummy accent with the raise of an upper-class eyebrow. Awethu Hleli as young Brenda is invigoratingly full of backchat and attitude, with hidden talents. Faniswa Yisa as Pumla, a diabetic, and Chuma Sopotela as Karabo, are witty but more restrained, until they put on their mourning garb. The funeral scenes are a riot, bringing the audience to tears of laughter, not sorrow. They sing at the funerals too, and once again I’m struck by the delight of watching a play for lovely, powerful females with lovely, powerful voices. The costumes and lighting enhance the simple set considerably, and director Pamela Nomvete has set a tight pace that keeps the laughter flowing. Another One’s Bread was commissioned by the Centre of Excellence in Food Security, a body set up by the Department of Science and Technology/National Research Foundation. The centre undertakes research to determine how a sustainable food system can be achieved to realise food security for a poor, vulnerable and marginalised population. Not the subject of a lot of laughs, perhaps, but Van Graan veered in the direction of comedy rather than one of his more hard-hitting scripts to tackle the issue. Besides, his comedies are never just comedies, as the laughs arrive on the back of social commentary and political barbs that make them clever and crucial as well as funny. The messages are all here, hidden amid the jokes, political wisecracks and banter. The topics are far-ranging, as are the problems in a typical township. The need for the women to collect cash and food because kids are going to school hungry and unable to concentrate. Brenda’s stealing of sanitary pads, not just sweets. Andiswa working as an estate agent determined to help black people buy houses in nicer areas that have traditionally excluded them. The play is shot through with pointed insights, giving the conversations depth below the surface laughs. Despite South Africa being one of the most prosperous countries in Africa, with less than 5% of the population undernourished, research in 2016 found that 27% of children under 59 months old were stunted by poor nutrition, affecting their long-term physical and cognitive growth potential. In adults, a high prevalence of obesity is causing serious health problems and currently 6% of the population has diabetes.